Cabot Creamery was one of the first co-ops established in Vermont and now comprises over 1200 family farms throughout New England and upstate New York. Cabot Creamery made their first cheddar in 1930 and today they make over twenty-five types of cheddar. In 2003, with the desire to make a traditional English-style clothbound cheddar, the folks at Cabot talked to Andy and Mateo Kehler at the Cellars at Jasper Hill about the possibility of a collaboration. The cheese would be fabricated at Cabot, then transported to the Cellars to be wrapped in cheesecloth and aged. This brilliant idea soon became a reality and production of Cabot Clothbound has grown steadily over the years. Cabot Clothbound is aged a minimum of ten months at the Cellars before being released to the marketplace. Once separated from the musty cloth wrap, a brilliant peach-colored rind is exposed. Firm and crumbly, the paste is bursting at the seams with notes of roasted cashews and salted caramel. On some occasions, the wheels even bear a certain likeness to the classic savory and sweet flavors found in Parmigiano. 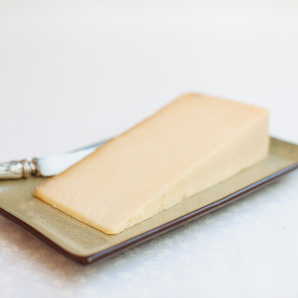 With its incredible consistency and snappy bite, Cabot Clothbound has garnered many awards and national recognition, making it perhaps the best known cheddar of its kind in the United States.